Change is a powerful and mysterious thing. The world around us responds in surprising ways to even the slightest adjustment–and it all starts with YOU. Back when I had my psychology practice, I would sometimes hear clients say: “I can’t change the world, so why even try?” The multitude of problems inherent in our world right now do seem pretty daunting. The temptation to hide your head in the sand and pretend it does not affect you is certainly understandable. Yet, looking at the bigger picture can provide some insight into navigating the change to create true magic. You just have to be ready for it. Watch for the signs. Perhaps you avoid change and/or find it uncomfortable. A clear example of resistance to change is feeling anxiety, even depression, due to lack of taking corrective action. But have you ever noticed that once you take corrective action, the fear and anxiety oftentimes drops by the wayside? You suddenly feel like a burden has been lifted from your shoulders and you may even wonder why putting it off was such a big deal in the first place. Now stop and consider what your putting off could have positively changed and/or affected those around you, maybe even hundreds or thousands of others as well. Will your “verse” be as a volunteer helping others in need, or as an activist for environmental change–or perhaps signing that petition to have your signature also count? Ultimately, every word and action DOES count. What you do for someone else on our planet, you do for yourself as well, because we are all connected in this global sea of humanity. So, be an ambassador for change. 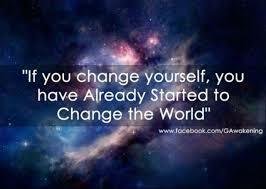 One voice can change a room, then change a city, then change a state, then a country, then even change the world. Stargate Journeys What Would You Do If You Weren’t Afraid?